Last night as we left town, the outdoor temperature was 92 degrees according to the thermometer in the car. We watched it fall to 89 degrees as drove by the small airport and then rise again to 91 degrees at the strip mall. It gradually fell to 82 degrees as entered the countryside and then in the drive back to our home, it fell to a final reading of 78 degrees. It was a fifteen minute drive so time wasn't the factor in this 14 degree drop in temperature. Just another reason I love living in the country. A short rainstorm came through tonight and broke the heat wave. Steve and I kept wandering back outside tonight, intoxicated by the glow of the first fireflies of the season, the chirping crickets and the smell of wet earth. When we got home, Ricky carried his package into the house and his dad told him to go back and carry in the groceries. With a bright smile, he replied, "Sure, Dad. I'll obey you, because you are the alfalfa male." 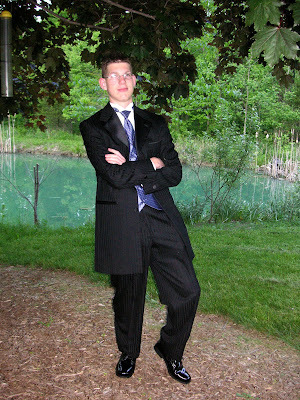 Remember your first prom? Were you cool like Ricky? My garden is so beautiful; I awake in the morning and drink it in. But these pictures are not of my garden. 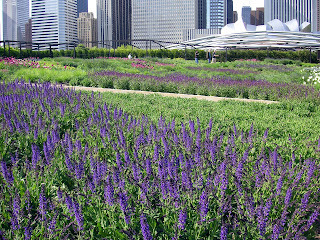 And these pictures do not do justice to the beauty of Lurie Garden in Millenium Park in Chicago, probably the world's largest green rooftop. The garden is inspiring though. 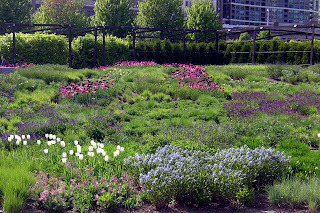 The garden at the site is on a hill and wouldn't this be breathtaking, especially divided by symmetrical paths as designed by Gene? 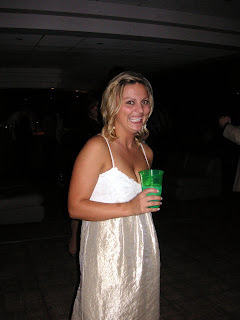 My nephew is engaged to this lovely lady and their engagement party was Saturday night in Chicago. 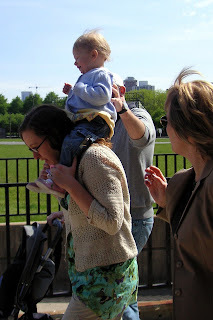 I then spent Mother's Day with my sister's family at the Art Institute and Millennium Park. Aneta moved to Chicago from Poland several years ago and our family is getting a quick lesson in Polish wedding customs. 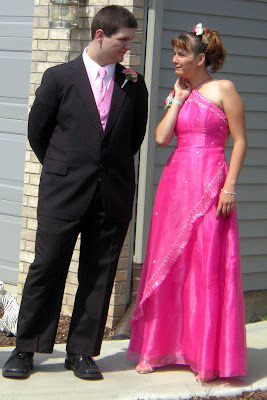 My sister was a little concerned that pictures would show up on this blog, but I'm just emailing it to her family. 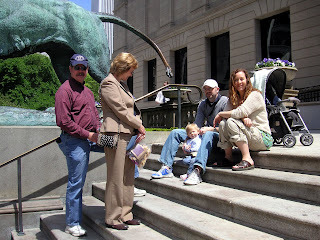 Here we are gathering on the steps of the Art Institute on Sunday. What a treat to view the medieval art with my niece who has an undergraduate degree in Fine Arts and a graduate degree in Medieval Studies. We are now on our way to the park. Look at the smile on Emily's face but her father and grandmother seem more concerned. 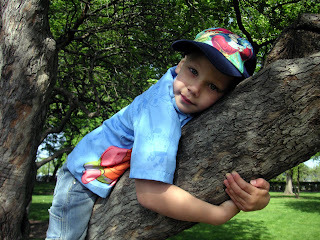 My other niece's four-year-old son was so satisfied with himself for climbing this tree. "I'm so strong, Aunt Martha." 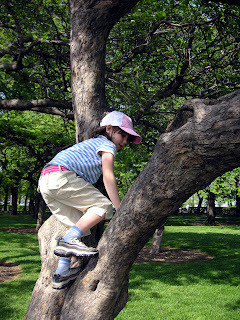 Of course, his six-year-old sister had to climb the tree also. I bought them shaped balloons in the park and she asked for an invisible purple flower. The college students were flummoxed. I can't believe I didn't get a picture of the groom-to-be. 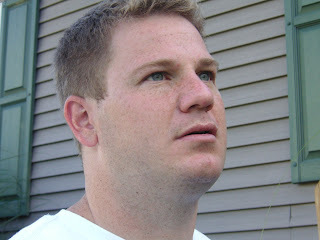 Here's a picture from several years ago. I also missed pictures of my other niece, her husband and my nephew Jon. Jon is an 8th grader and I've never met an 8th grade boy so self-assured, so sweet and so funny. He had no trouble socializing with his uncle's big-city friends, but still gives his Aunt Martha big hugs. 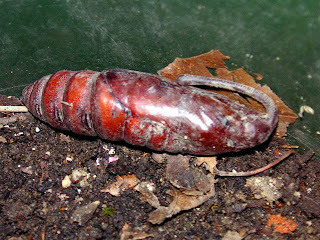 As I was tending my raised vegetable bed (the spinach is about ready to harvest), I found this strange looking thing. At first I thought it was some type of unusual seed pod, but it moved when I touched it. The pointed end on the left was segmented and the creature would move back and forth. The end with the "tail" was a hard case, shell or cocoon. I don't even know where to start identifying it. Any ideas? UPDATE: Thanks for your help. My brother-in-law narrowed it down to cecropia moth. This afternoon while I was still at work, Ricky call his orthopedic doctor and asked to have a different type of knee brace. Then he called me with the information because they needed my approval since he was a minor. 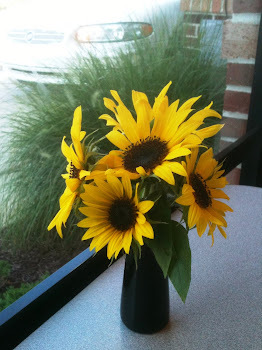 I was taken aback, but marveled at his independence. Is this a foreshadowing of how quickly my role in his life will change?